We are supported by state-of-the-art facilities to manufacture hydraulic high lift pallet truck. 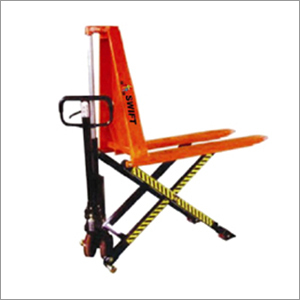 This material handling equipment is based on latest technology and helps in transporting of goods in the warehouse and similar establishments. The model of high lift pallet truck is provided in specifications of minimum and maximum fork height of 85mm and 800mm, respectively. The operator can adjust the height according to his/her requirements. It has innovative design and the machine is assured to have highest quality as it goes through comprehensive testing in our premises. This is a standard model and we can fabricate it as per the specifications provided by the customers. Accordingly, we can provide the hydraulic high lift pallet truck in different fork sizes, length and width. Its pump design is all-inclusive and is characterized with leak-proof nature; eliminating the maintenance requirements as well as elevating the service life of the equipment. It wheels are made of rubber, PU, Nylon as per client's suitability.